2015 Vintage Champs has come and gone, leaving behind a new conception of the metagame, and exciting technology with which to address it. Big congratulations should be given to Brian Kelly with his Oath of Bomberman victory, but let’s see what else Vintage enthusiasts were able to cook up. Hangarback Walker was undoubtedly the most impactful new printing from Magic Origins. It appeared alongside Mishra’s Workshop in 8 decks in the Top 32, although several ran 2-3 copies, and one list split the Walkers between main and sideboard. It even made a splash as a clever new target for Trinket Mage to fetch in Brian Ritter’s Blue Moon control deck. A number of choices that may seem unusual, such as 2 Mindbreak Trap, 1 Rolling Earthquake, and 2 Dig Through Time, have been repeat occurrences within the archetype. The big innovation here is revising the creature base to include Keranos and Hangarback Walker. Keranos seems important as a mana sink against the blue decks, where indestructibility and the inconsistency of Swords to Plowshares against the “God” cards will likely guarantee a continued planeswalker-like effect regardless of opposing Pyroblasts or Lightning Bolts, should Keranos resolve. Hangarback turns a Trinket Mage topdeck in the late game into a serious threat, and can be played as a small creature early for extra pressure. The versatility that makes it good in the Workshops decks makes it viable here. This is an exciting evolutionary step for the archetype. MUD (colorless decks powered by Mishra’s Workshop) has been the dominant artifact-based archetype of Vintage for a few years now. However, the raw power of Goblin Welder and the metagame-dependent utility of Lightning Bolt can still put a red-based Workshops deck into a high finish. This is more aggressive and burn-focused than most Vintage decks. The Lightning Bolts help establish board presence early but seem likely to be used as burn as the game goes late. Razormane Masticore, Sword of Fire and Ice, and only Lodestone Golem as a Sphere of Resistance effect suggest that this deck is oriented around gaining a big tempo lead and quickly converting that into a win. With Goblin Welder, Staff of Nin, and those same Sword of Fire and Ice, the deck is definitely capable of winning a long game, but only when it has the freedom to abuse those cards. All told, this looks like an expertly metagamed choice for the Vintage Championship, and probably not a format mainstay in the making. Storm decks have been represented in very low numbers for quite some time now. This fact is likely influenced by the dominance of Mishra’s Workshop online and in large events, as well as the omnipresence of free countermagic. With Dark Petition, these decks gained a key new tool that lines up perfectly with Necropotence in the early game, and with Yawgmoth’s Will in the late game. The sideboard in particular is fascinating. The Strip Mine + Wasteland package provides land superiority against Workshops decks and has utility against a variety other targets such as Bazar of Baghdad. The maindeck is hardly less interesting. By omitting Windfall and red entirely as a color, Jesse is essentially saying that Dark Petition gives the deck enough density and celerity that Burning Wish is no longer needed. The deck can run a pure mass of Blue and Black restricted cards and tutors while maintaining a “true” 15-card sideboard. If this claim proves to be true, we might see a resurgence of Storm combo. Finally, I’d like to examine some of the developments within Dredge. Sullivan Brophy piloted his build to a NYSE win as well as a Vintage Champs Top 8. 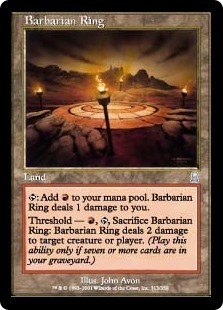 The most interesting cards in my opinion are Barbarian Ring and Petrified Field. In a metagame with 25% Workshops in the field overall, Top 8, Top 32 – and a whopping 7 of 16 (44%) in the Top 16, Petrified Field is an obvious choice. The inclusion of Field by “normal” anti-hate Dredge decks as well as the transformative lists indicates not only the heavy presence of Workshops, but the ready ability of Dredge to fight back. Barbarian Ring functions as an analog to Sudden Shock to kill Containment Priest or Yixlid Jailer. At the same time, it increases the land count for Ingot Chewer, is essentially a 1-mana Shock instead of a 2-mana Shock, and can even provide that single mana if drawn in multiples. Finally, in the games where Dredge must use its transformative maindeck by casting pathetic creatures and hoping to overwhelm the opponent, Barbarian Ring can be used repeatedly with Petrified Field to finish off a low-life opponent without being subject to counterspells or to most graveyard hate. If you’re going to build an anti-hate Dredge deck, this is a very clever and effective way to do it. New and interesting technology has visited a huge range of archetypes with this latest Vintage Champs. Be prepared to face improved strategies from all corners of the format. Dredge is more prepared than ever to fight post-board. Storm is again at a maximum of blue and black powerful cards. Workshops is looking incredibly threatening with a new monster in Hangarback Walker. Of course, you must also prepare to face Oath/Bomberman hybrids in paper events. Good luck, and may you always draw your spicy new tech card when you need it.